Light textured rolls that might remind you of the ones in old school lunches. 3-1/3 cups all-purpose flour (15 oz) -- If you don't weigh it, fluff it up very well before measuring. In bowl of a stand mixer, mix together the warm water and 1 teaspoon of the sugar. Sprinkle the yeast over the top, and let it stand for about 10 minutes, until the yeast is foamy. Beat the egg in a small bowl then measure out about 1 tablespoon and discard. Whisk in the milk and salt, then add the egg milk mixture to the yeast mixture. Combine the flour and sugar in a separate bowl. Cut in the shortening with a fork. Gradually stir the flour mixture into the yeast mixture. Set the mixing bowl on the stand mixer with the dough hook and knead for about 3 minutes or until dough appears smooth and elastic and is pulling away from the bowl. Cover the mixing bowl with plastic wrap or a warm towel and set it aside to rise for 1 hour. When the dough has risen, pour the melted butter over it, return to stand mixer and knead with the dough hook for about 3 more minutes. (See Note). Dough should be smooth, elastic, slick, but not shaggy. Flour a large surface. Let the dough rest for a few minutes, then roll or pat out to a little less than 1 inch thick. Using a knife, cut the dough into 2 inch squares. Tuck the corners of the squares under to make smooth rounds and set them in the pan (I used two 9 inch round pans with about 6 balls of dough in each. Space about 1 inch apart. Set pans aside for another 40 minutes rise. 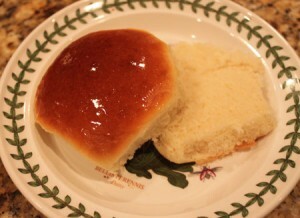 Preheat the oven to 400 degrees F. If you like, brush the rolls with some extra melted butter. Bake the rolls for about 12-15 minutes, until golden brown. I brushed them with a little more butter before serving. One step I've kind of modified over the years is when adding the butter after the first rise, I just stir it a bit and then knead it by hand rather than returning to the stand mixer. The dough is squishy, scraggly and weird. Rather than roll it out, I pick up lumps a little smaller than a plum, squish them into lumpy balls and set them about an inch apart in two 9 inch round cake pans (about 7 to a pan). They look lumpy and terrible at this point, but they look pretty when they are fully risen and baked.